Standing tall over a medieval square in the center of the Gothic Quarter, the Barcelona Cathedral (Cathedral of the Holy Cross and Saint Eulalia) is the seat of the Archbishop of Spain and a major landmark of the city. The cathedral is known for its 14th-century cloister full of palm trees and a Gothic portico where 13 geese wander. A major landmark in Barcelona, the cathedral is featured on nearly every sightseeing excursion, from bicycle tours to tapas crawls. Worshipers can enter for free, while there’s a donation requested for cultural visits, as well as for access to the choir and rooftop terraces, which offer one of the best views over medieval Barcelona. Don’t miss a trip down to the crypt to see the tomb of Santa Eulalia and the reliefs depicting her martyrdom. 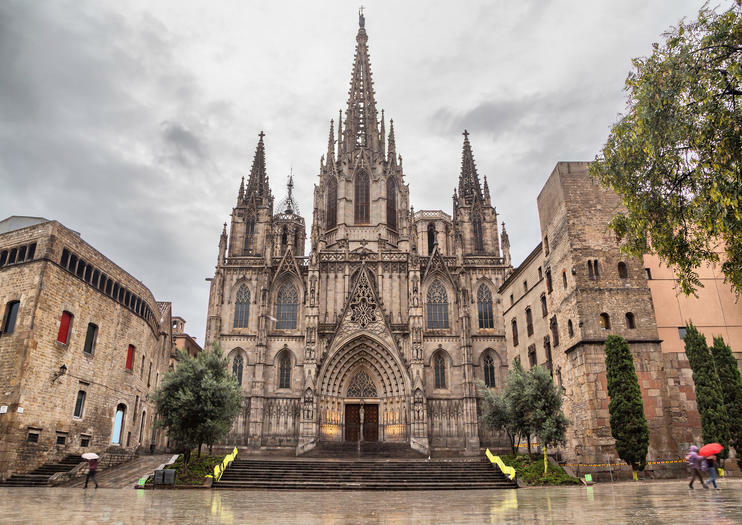 The Cathedral of Barcelona is a must-visit for history buffs, spiritual travelers, and first-time visitors. Remember to dress respectfully by wearing clothes that cover your shoulders and extend to your knees or lower ; the cathedral is an active place of worship. The cathedral is wheelchair accessible; there’s an accessible entrance at the cloister on Carrer del Bisbe. The Barcelona Cathedral is centrally located and easy to reach on foot from anywhere in the Old City. From other areas of the city, take the metro to Liceu (Green Line) or Jaume I (Yellow Line), or ride the hop-on hop-off sightseeing bus to Catedral-Gotic station. The cathedral is open daily throughout the week for worship during the morning and evening hours, and for cultural visits during the afternoon. Plan to visit on a weekday during the shoulder season (October to April) to enjoy the cathedral with smaller crowds. The palm-filled cloister of the Cathedral of Barcelona is home to 13 special residents, a flock of geese that have been enjoying the garden and fountains since medieval days. The number of geese is believed to represent the age of Eulalia, the city’s patron saint, at the time she was martyred. No planning is required for the perfect evening out in Barcelona when you pre-book this flamenco experience. With a single booking, you can watch a live flamenco show inside the UNESCO-listed Palau de la Música Catalana—worthy of tour on its own—and optionally add dinner and drinks to enjoy during the performance. You can visit the treasure, the crypt, the museum, the garden and the tower. Once on top of the tower, 54 meters high, you will be able to see the amazing views of all the city of Barcelona and understand why Santa Maria del Pi’s bell tower was one of the highest religious towers of the city throughout centuries. Gaudi’s magnificent La Sagrada Familia cathedral is one of Barcelona’s most visited attractions and this tour saves you potentially hours of time with skip-the-line tickets. Also on this tour, enjoy a walking tour of Barcelona’s Old Town and Gothic Quarter; admire Modernist architecture including Casa Batlló, Hospital de Sant Pau, and Casa Lleó; and take in the views from Montjuïc Mountain. Sample all that Barcelona has to offer during this 8-hour sightseeing excursion in the Catalan capital. Start along upscale Passeig de Gracia, exploring the street’s high-end boutiques and modernist buildings like La Pedrera and Casa Batllo. You’ll continue your day at the UNESCO World Heritage-listed Sagrada Familia, learning about the inspiration for this jaw-dropping building and its one-of-a-kind creator, Antoni Gaudí. You’ll also enjoy visits to other iconic attractions including Las Ramblas, Montjüic Mountain, the Gothic Quarter, and much more. Round-trip transport and a guide are also included. Combine Barcelona’s beautiful art and architecture on this private tour. Start with your guide at the Picasso Museum, which houses a well-rounded collection of the famed-artist’s work, including rarely seen sketches from his youth and stunning ceramics. Next your guide will take you around the sights of the Gothic Quarter or Borne, two of Barcelona’s oldest and most charming neighborhoods. Glide around Barcelona’s most alluring attractions on a 2.5-hour electric bike tour led by a knowledgeable guide. Enjoy the ease of riding a smooth and speedy electric bike as your guide takes you to legendary landmarks such as La Sagrada Familia. Select from two different itineraries according to your interests, and gain fascinating insights into the culture of Catalonia’s vibrant capital. Enjoy an intimate atmosphere and personalized attention on this small-group tour, where numbers are limited to 12 people. See Barcelona’s most beloved landmarks and attractions on a comprehensive tour that offers an ideal introduction to this beautiful Spanish city. After a convenient hotel pickup, travel with a personal guide and immerse yourself in the city’s celebrated architecture, including the striking Hospital de Sant Pau and La Sagrada Familia (extra cost.) End your outing with a walking tour through the Gothic Quarter and a visit to the hilltop Mirador de l'Alcalde.